After a 24 hour delay due to the car misbehaving (flat battery) I finally got to visit Jekka's Herb Farm today. Jekka is the most famous herb grower in the country thanks, at least in part, to the fact that she's helped plan and plant Jamie Oliver's herb garden. Normally you can only buy from her online but three times a year she has an open weekend where you can visit and collect your own herbs. Despite the fact that the 'farm' (more like a commercial nursery) is down pretty, twisting country roads it's not quite as romantic as you might think. I was expecting a beautiful Sissinghurst-style herb garden rather than a few polytunnels but everything in them looked robustly healthy. I went mad and bought a whole range of herbs for the tiny paved area outside our flat: parsley, sage, thyme, rosemary, mint and oregano - and rather more ambitiously chervil and tarragon, herbs that are tricky to grow. Plus a couple of 'cut and come again' living salads that I hope will see us through the summer. I hardly like to admit how much it cost, rationalising it on the basis that it's cheaper than buying cut herbs and that it worked out less than a night out for two at a cheap(ish) restaurant. But by the time I'd bought a couple of extra containers, some compost and a small fork and trowel I'd spent a fair bit. As it was brighter than forecast this afternoon I potted everything up and must say it looks pretty good. I christened the pots by adding some just-picked oregano and mint to a pork osso buco this evening the recipe for which I'll post in a couple of days' time. As we were out and about we decided to do our weekend shop at Waitrose for once which cost a further hefty amount, despite the cheapness of the pork (£3.45 for enough for 4). Which made me realise that going shopping with the car is a Bad Idea. If you only buy what you can carry you're less likely to overspend - although obviously it depends how near you are to the shops. How do you shop? Do you take the car and do one big weekly shop? If so do you find you need to top up again during the week? Or do you shop on foot and carry your shopping home? Which do you think is cheaper? 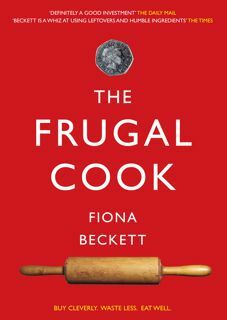 Why frugal cooks should be on Twitter! If you haven't succumbed to the lure of Twitter you may be wondering what all the fuss is about. I followed it for about six months feeling similarly sceptical. It seemed like the ultimate time-waster - more wittering than twittering. And 4 you can get some really good tips on healthy, inexpensive eating. I predict you'll be hooked! PS A couple of tips: Don't fail to fill in the bio so people know who you are. And make your tweets (the 140 character mini-posts) public. No point in being on Twitter if you don't. 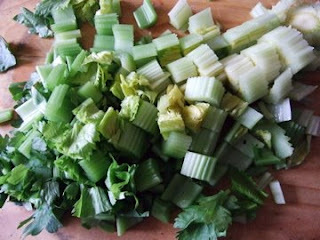 How often do you find anyone - cookery writers included - singing the praises of celery? Yet it's a frugal cook's friend - inexpensive, adaptable and tasty. It helps admittedly if you can buy the sort of luxuriant bunches you get in France, even in the supermarkets, which still have their leaves but even so it's a useful veg for any cook to have to hand. Last night I used most of the rest in a simple dish of braised celery, simmered with a couple of green onions and a little stock which we had with a dish of stuffed mussels in tomato sauce (a Languedoc speciality). There was enough sauce and celery leftover to combine the two for a soup today but I shall have to think what do do with the rest before we leave early on Monday. 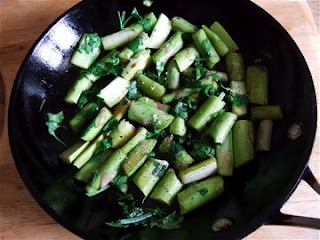 I could add it to a salad - you can use the stalks for crunch and the leaves instead of parsley. It's very good with apple and with tuna - and cold chicken though I don't have any at the moment. You can add it to a tuna or chicken sandwich filling with mayo. You can use lengths of the stalk to dunk in dips such as hummus or with whipped goats' cheese. I suspect you could grill it, fennel-style, on a ridged grill pan and dress it with olive oil and lemon juice which would be great with grilled fish. So what's the problem? Why don't we hear more about it? Are you a celery lover or a celery hater? And if you like it tell me what you do with it. There was also a stale baguette (a common occurrence - baguettes stale very quickly) which I sliced and toasted on the hotplate then rubbed with garlic Spanish-style and drizzled with some of the oil I'd used to cook the peppers. I laid it all out on little plates and must say it looked quite appealing. I could have added a couple of hard boiled eggs or a few slices of chorizo too if we'd had them. Without looking it up I'm sure that this is the origin of tapas and their French counterpart hors d'oeuvres: a way to use up the leftovers from the previous day - cooked or uncooked. It took next to no time to prepare and felt like we'd had a 'proper' meal. People sometimes question whether you should use offer leftovers to guests (do you? would you?) but I'd have been more than happy to share this meal with friends. I've been thinking over the past couple of days about how easy it is to eat well in France. Not so much in restaurants any more - the standard overall is pretty poor these days - but in terms of the produce you have on your doorstep. The local greengrocer down the road from where we've been staying has seven or eight different kind of lettuces for example, most locally grown. In England you'd be lucky to find two or three. Everything is really fresh too. You can smell the earth on the lettuces. 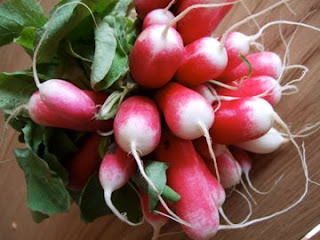 Radishes have real crunch. Even the early strawberries smell of sweet, ripe fruit. It makes you want to prepare food simply so you can enjoy those flavours - and that after all is what good cooking should be about. You can make a simple lunch out of a baguette, some radishes and a chunk of paté. 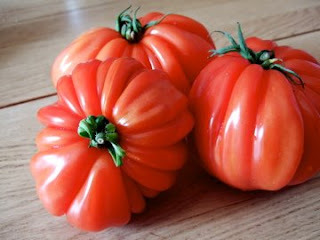 Ripe tomatoes need no further elaboration than a glug of olive oil, salt and pepper and a trickle of vinegar. (If you slice them season them and anoint them with oil then leave them for 10 minutes they make their own delicious juice. The vinegar is just the final seasoning) You can add herbs like basil or parsley or scatter in some finely sliced white or green onions but you don't have to. The art of good home cooking in my view lies not in being highly skilled but knowing what ingredients work together. Although you can become a perfectly competent cook by mastering a few basic recipes to be a great one you have to be a good eater, to really enjoy your food. I get my best ideas these days not from complicated recipes but seeing what ingredients chefs put together and trying to reproduce what they do in a less expensive and time-consuming way. If you heighten your awareness of flavour and flavour combinations you're on the road to better eating! What most inspires you to cook? Or do you regard it as a chore? As we were out to supper with friends last night and off to France tomorrow I deliberately didn't buy any food this weekend, reckoning we could easily live out of the fridge and freezer. We could and did. Lunch was a warm 'salad' of black pudding, leeks, apple and potato (above), supper tonight some leftover braised oxtail I froze a few weeks ago topped with mash (also frozen) and served with carrots and hispi cabbage. There are more than enough carrots for the two of us so I'm going to blitz the rest and freeze them for a soup when we come back. We also managed to polish off a bit of chorizo and some leftover plums (not at the same time, I hasten to add). I've frozen the cheese that would have gone off while we were away (not ideal but it'll be fine for cooking) and will freeze any leftover bananas for smoothies. Peel and halve the potatoes and cut them into thick slices. Tip into a bowl of cold water and swirl them around to get rid of some of the starch then pat dry with a clean teatowel. Heat 2 tbsp of the oil in a frying pan, add the potatoes and fry for about 7/8 minutes, turning them over occasionally. Meanwhile peel and thinly slice the onion and quarter and slice the a apples. Add the onions to the pan, stir and cook for a couple of minutes, then add the apple pieces and stir. Continue to cook, stirring and turning until all the ingredients are well browned and soft (about another 10 minutes), adding a little extra olive oil if it looks too dry. Add the sage for the last 5 minutes of the cooking time. Meanwhile heat the grill, rub the black pudding slices lightly with olive oil and cook them for about 4 minutes each side until hot and crispy. Lay them overlapping slightly on warm plates and spoon the potato and apple pan fry alongside. While I was away last week my husband discovered a new felafel joint had opened not far from where we live in Bristol called Falafel King. Actually they've been around for a while at gigs and other shows and have a stall down on the docks but they now have a posh new takeaway and café in Cotham. It was buzzing when we got down there at lunchtime - justifiably so in terms of the size of the portions. £4.50 will buy you a monster wrap smothered with hummus and topped with lovely light puffy felafel (much, much better than the ones I attempted last year), two different slaws and whatever else you want to add: pickles, sumac and tahini, chilli or sour mango sauce. I suspect you'd find a definitive recipe for this ultra-frugal dish in Claudia Roden's superb New Middle Eastern Food which I lent a while ago to my son and realise he hasn't given back or try this version from About.com. Wikipedia also has quite an informative entry. I'll have a go at it myself as soon as I can find the right beans. Have any of you made foul medames? If so do you have a good recipe to share?